Leicestershire (abbreviated Leics) is a landlocked county in central England. It takes its name from the heavily populated City of Leicester: traditionally its administrative centre, although the City of Leicester unitary authority is today administered separately from the rest of Leicestershire. The county borders onto Lincolnshire, Rutland, Northamptonshire, Warwickshire, Staffordshire, Derbyshire, and Nottinghamshire. County Hall, situated in Glenfield, about 5 km (3 miles) northwest of Leicester city centre, is the seat of Leicestershire County Council and the headquarters of the county authority. The City of Leicester is administered from offices in Leicester itself and the City Council meets at Leicester Town Hall. The River Soar rises to the east of Hinckley, in the far south of the county, and flows northward through Leicester before emptying into the River Trent at the point where Derbyshire, Leicestershire, and Nottinghamshire meet. A large part of the northwest of the county, around Coalville, forms part of the new National Forest area extending into Derbyshire and Staffordshire. The highest point of the county is Bardon Hill at 278m/912ft, which is also a Marilyn. Leicestershire was recorded in the Domesday Book in four wapentakes: Guthlaxton, Framland, Goscote and Gartree. These later became hundreds, with the division of Goscote into West Goscote and East Goscote, and the addition of Sparkenhoe hundred. Leicestershire's external boundaries have changed little since the Domesday Survey. The Measham-Donisthorpe exclave of Derbyshire has been exchanged for the Netherseal/Overseall area, and the urban expansion of Market Harborough has caused Little Bowden, previously in Northamptonshire to be annexed. 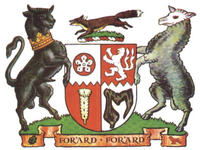 In 1974, the Local Government Act 1972 abolished the county borough status of Leicester city and the county status of neighbouring Rutland, converting both to administrative districts of Leicestershire. These actions were reversed on 1 April 1996, when Rutland and the City of Leicester became unitary authorities. 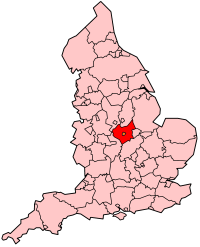 The population of Leicestershire (excluding the city of Leicester) is 609,579 (2001). The county covers an area of 2,084 sq km (804 sq mi). The largest population centre is Leicester, followed by Loughborough. 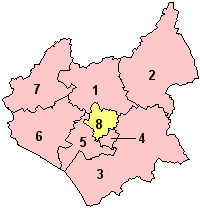 Other major towns include Ashby-de-la-Zouch, Coalville, Hinckley, Market Harborough, Melton Mowbray, Oadby and Wigston.